In the year 2000, The town of Ipswich produced a study called the “Green Ring Report” that documented goals for preserving the nature of the outlying areas of the town. Town meetings in Ipswich have voted to protect hundreds of acres of land, making it available for the general public and preserving the land from development. More than 50% of land in Ipswich is protected by the town, state and non-profit organizations.The town’s investment adds to other preserved land in the town preserved by Willowdale State Forest, Essex County Greenbelt, the Trustees of Reservations the Ipswich Great Estates Bylaw, and existing municipal facilities and conservation land. 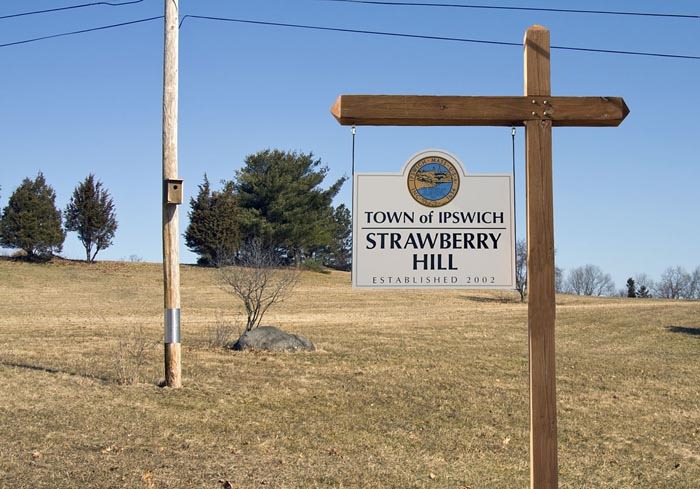 The Ipswich Open Space Committee was established in 1994, and meets monthly to pursue town goals related to the conservation and protection of open space properties throughout town. The established the Open Space, Recreation, and Water Supply Protection Fund, which was approved by both Town Meeting and the State legislature. This was followed in the spring of 2000, by the authorization of a $10 million Open Space Bond at the Annual Town Meeting, designated for the protection of land for open space, water supply protection, and recreation. In 2011, the town approved an additional $5 million Bond Authorization for the purpose of open space acquisitions and related costs to develop properties for recreational uses. Since the inception of the Open Space Bond Authorization the Town has protected almost 800 acres of land through acquiring fee ownership of properties, and/or through conservation restrictions placed on private property. 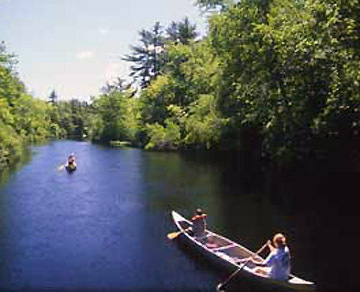 The Open Space Program prepares an annual operating budget that is funded through the Open Space Recreation and Water Supply Protection fund, an off-budget revolving account established in 1999 at Special Town Meeting Article 20 and approved by the Massachusetts Legislature in 2000 under Chapter 366 of the Acts of 2000. The annual budget supports staffing of the Open Space program, and expenses related to pre and post-acquisition and stewardship related open space costs. The revenue sources for the fund include hotel/motel excise tax, roll-back taxes from Chapter 61A (conversion of agricultural property under Chapter 61A to residential property), and income from a cell tower lease on town property. Dow Brook Conservation Area (formerly A.C. Builders) – 34 acres – Map 12, LOT 3A – High Street: This parcel has over 800’ of frontage on Dow Brook, which drains directly into the Dow Brook Reservoir, a public drinking water supply, only 650’ from the property line. In addition to providing quality wildlife habitat within a regional greenway of over 3,000 acres, this parcel also provides a key link in the Bay Circuit Trail and numerous opportunities for passive recreation. After reimbursement from the Self‐Help Grant, the Town’s cost for this property was approximately $150,000. Public access to the property is located in a parking area next to White Farms Ice Cream on High Street, near the Rowley town line. 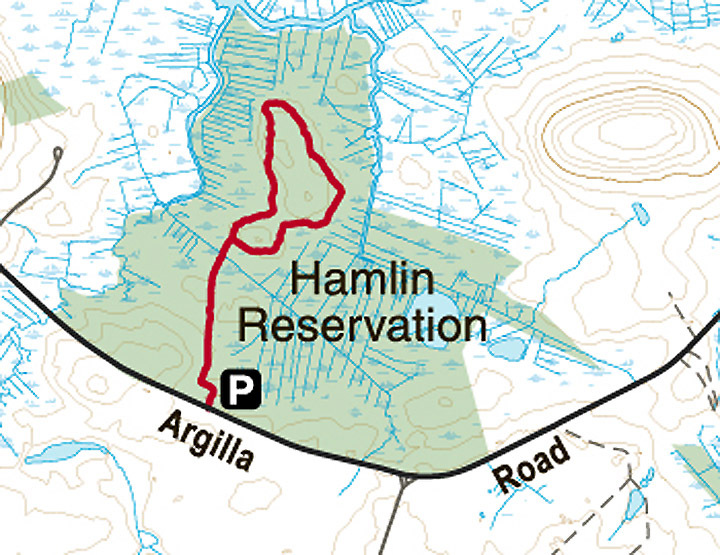 Read: Dow Brook Conservation Area Management Plan. 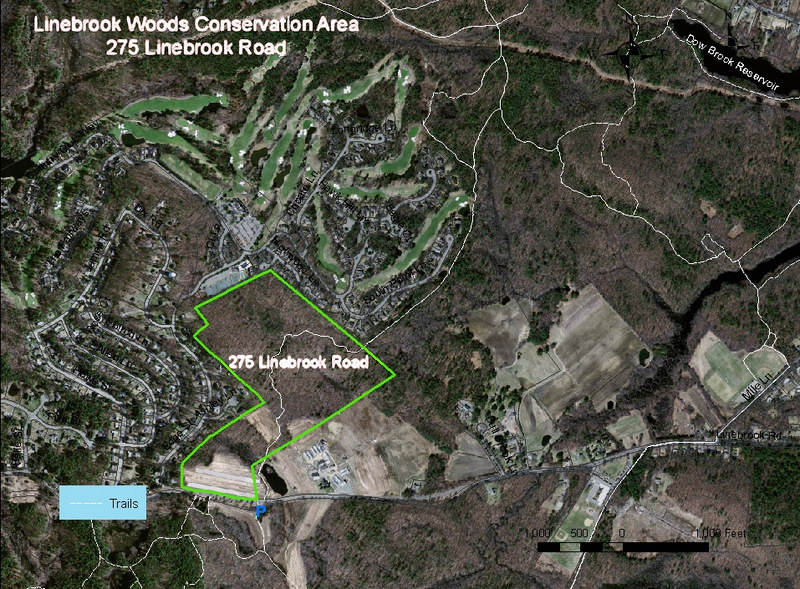 Negotiations for the Town’s acquisition of this parcel began in the spring of 2002 and concluded with the Town’s purchase of the property in April, 2003 with assistance from a Self‐Help grant from the Massachusetts Executive Office of Environmental Affairs – Division of Conservation Services for approximately $200,000. This undeveloped, landlocked parcel located off of High Street is located less than 100’ from the Dow Brook Reservoir, a main source of drinking water for the Town of Ipswich. It is completely surrounded by town‐owned land in an area that is managed for watershed protection and protection of the Town’s drinking water supply. The owners of this parcel agreed to sell the parcel to the Town for its assessed value of $33,000. On June 25, 2008, the Town purchased the Lynch Property on Linebrook Road for the primary purpose of drinking water supply protection for the Bull Brook Reservoir. The property was acquired at a cost of $975,000, of which $495,175 derived from a Massachusetts Department of Environmental Protection Drinking Water Supply Protection Grant. The remainder of the project cost was covered by the Town’s Open Space Bond Authorization and the Open Space, Recreation, and Water Supply Protection Fund. The parcel has more than half a mile of frontage on Bull Brook and lies entirely within the Zone A and B Protection District for the Bull Brook Reservoir, a component of the larger Bull Brook – Dow Brook Reservoir complex which provides more than 50 percent of the water used annually by the Town of Ipswich. This landlocked parcel abuts Country Club property and municipally owned Dow Brook watershed land, and provides wildlife habitat and additional protection for the Dow Brook Reservoir. The spring 2001 ATM approved the addition of this parcel to the “list of priority parcels”. The Town acquired this property on January 31, 2002. The Town also received a grant from the Department of Environmental Protection to cover 80% of the acquisition price. After this reimbursement, the Town’s total cost for this property was $12,140. Great Neck Conservation Area (formerly Proprietors) – 85.5‐acres (16 parcels) – Map 15D, Lot 81C (Core Parcel): Great Neck Conservation Area’s 85.5 acres are divided into eight geographically separated parcels, the centerpiece of which is the 67.5‐acre Core Parcel beginning at the fork of North Ridge and Little Neck Roads. The Clark Pond overlook located on Clark Road opened to the public in the spring of 2011. Clark Pond is part of the Great Neck Conservation Area. 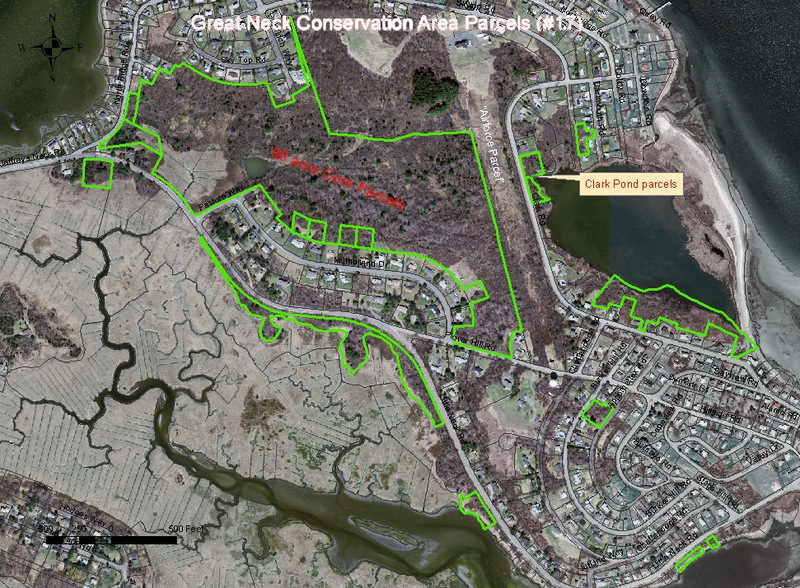 The Town acquired 85.5 acres of undeveloped land on Great Neck, now known as the Great Neck Conservation Area, on January 31, 2007 after more than two years of preparation and negotiation with the former owner, the Proprietors of Great Neck, Inc. The primary purpose of the acquisition was the protection of highly sensitive coastal wetlands and wildlife habitat, especially critical to migratory birds, whose population is declining. The net cost to the Open Space Bond of the nearly $1.7 million purchase was $283,000. The remaining funding was raised from the following sources: US Fish and Wildlife Service National Coastal Wetlands Grant ($846,000), Commonwealth of Massachusetts Self‐Help Grant ($500,000), Massachusetts Department of Conservation and Recreation ($54,000), and the Fields Pond Foundation ($11,000). 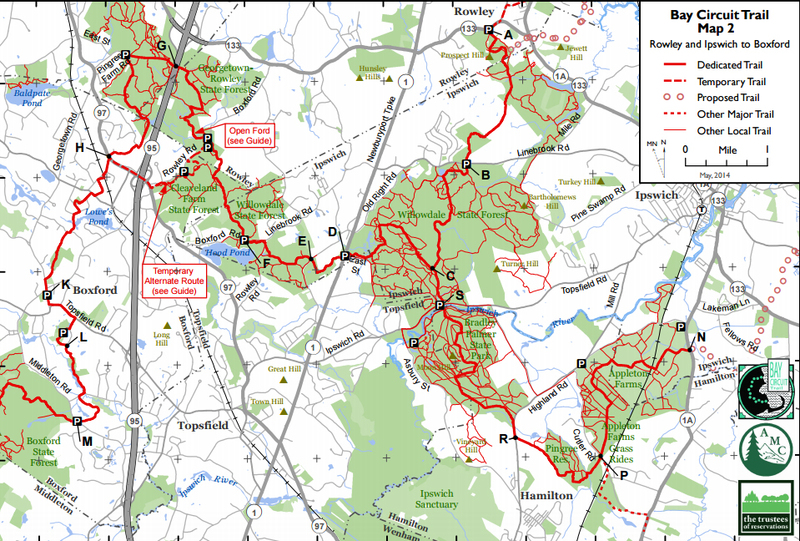 Map provided by the Essex County Trail Association. 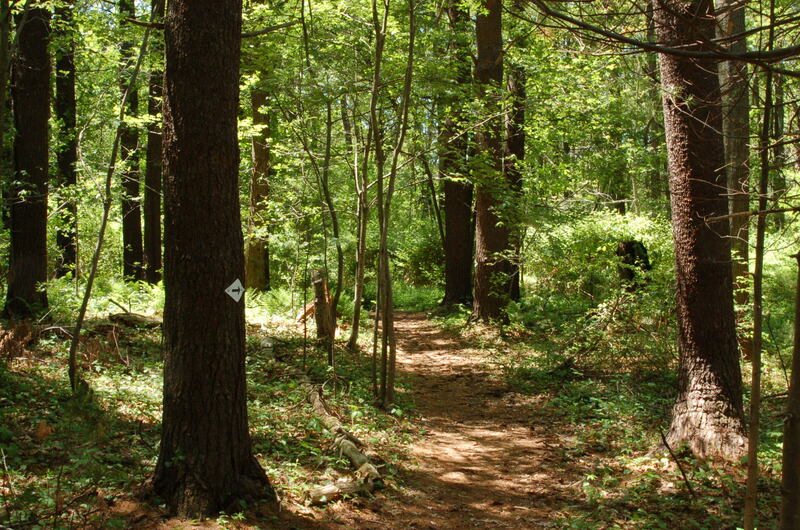 Trails connect to Willowdale State Forest and th Dow/Bull Brook Conservation area. 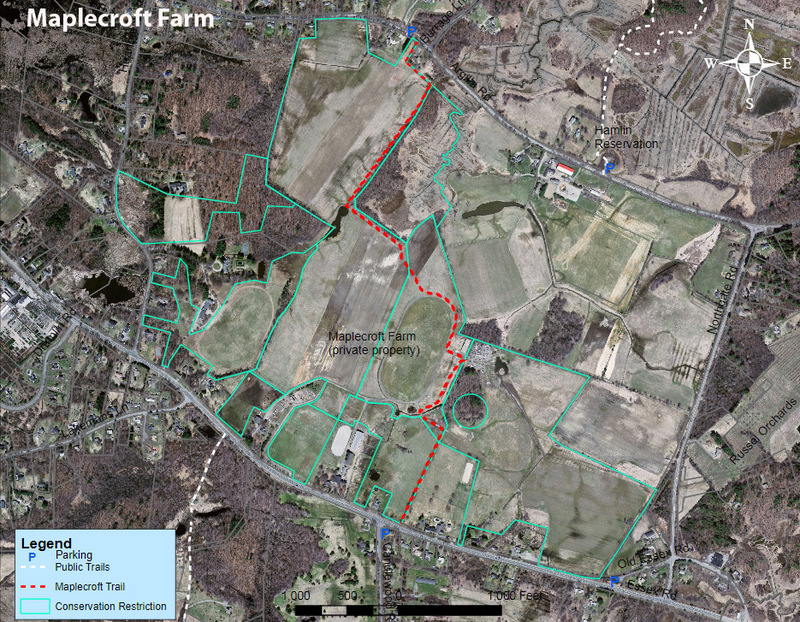 Maplecroft Farm Conservation Project – 247 acres (2 Conservation Restrictions and 1 Agricultural Preservation Restriction). In the late spring of 2008, the Raymond family, owners of nearly 290 acres on Heartbreak, Essex and Argilla Roads, approached the Trust for Public Land (TPL) to begin discussions about preserving their family farm. 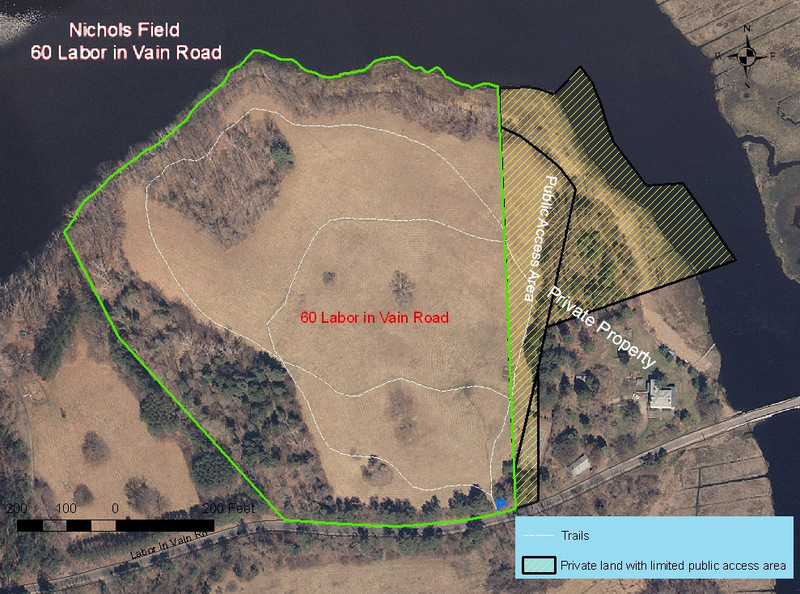 Ipswich voters considered this opportunity at Town Meeting in the fall of 2009, and on October 19th the Town voted to authorize an expenditure of up to $2.2 million from the Open Space Bond toward the permanent conservation of this property. The Town’s contribution, which ended up being $2,070,000, was ultimately augmented by a package of funding sources that collectively made the project possible, including contributions from two state agencies ($1,830,000 from the Department of Agricultural Resources (DAR) and $700,000 from the Department of Conservation and Recreation (DCR)), and $500,000 in private donations raised through a campaign led by ECGA. 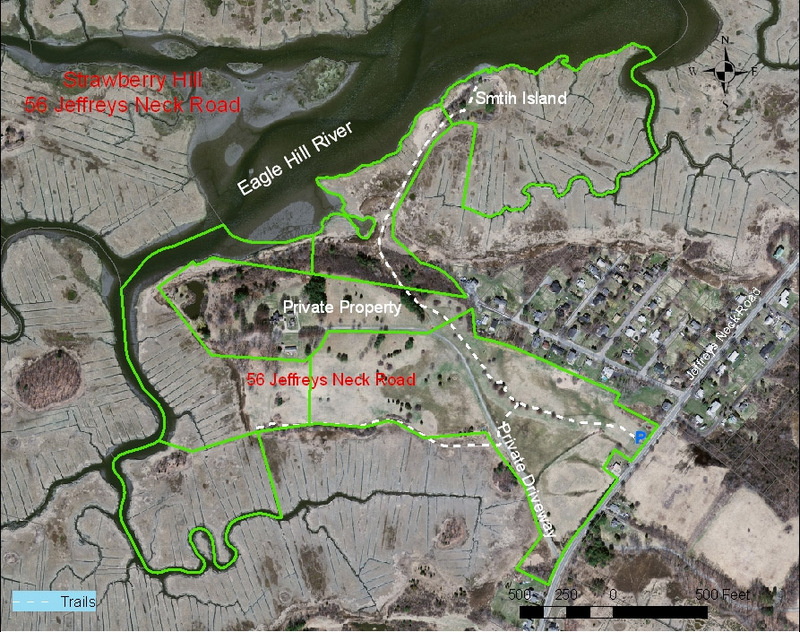 Additionally, Essex County Trails Association holds a 1.5-mile trail easement across the property, connecting Essex and Argilla Roads, and Ipswich Youth Soccer held a lease for use of the Raymond Fields for 3.5 years through June 30, 2013, which was not renewed by the owners. 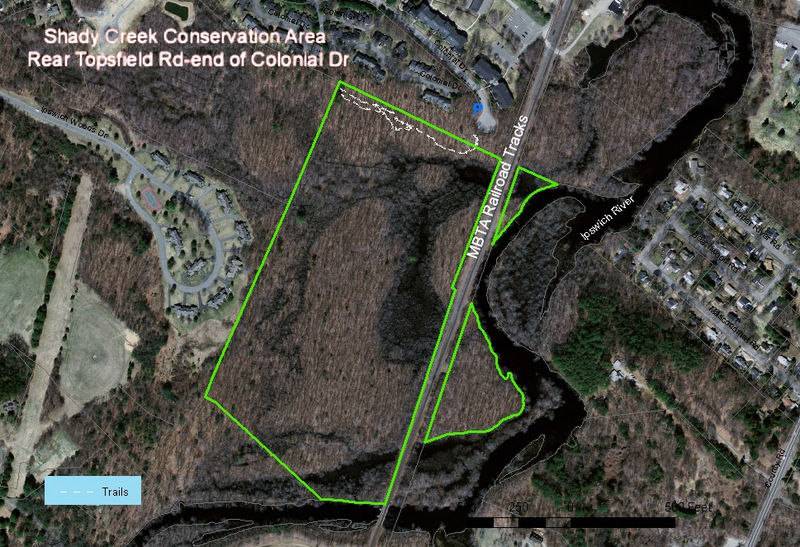 Shady Creek Conservation Area (formerly M&L Realty Trust) – 44‐acres – Map 53B, Lot 44 – end of Colonial Drive cul‐de‐sac: The Town closed on the approximately 44 acres of land now known as the Shady Creek Conservation Area on December 20, 2006. The Shady Creek Conservation Area consists of forested uplands and wetlands, including over one‐half mile of frontage along the lower Ipswich River, providing critical habitat to a very wide variety of wildlife species. The property includes several vernal pools that sustain species of amphibians unable to breed in any other type of wetlands. The purchase price of the property was $110,000, with net cost to the Open Space Bond of $35,400. The remaining funding came from the following sources: Commonwealth of Massachusetts Self‐Help Grant ($61,600), Fields Pond Foundation ($8,000), and the William P. Wharton Trust ($5,000). Read: Shady Creek Conservation Area Natural Resource Report. Access to the Shady Creek Conservation Area is at the end of Colonial Drive. Photo courtesy of the Essex County Trails Association. Trailhead access to the Shady Creek Conservation Area is located at the end of Colonial Drive, with reserved parking on the west (right‐hand) side of the road immediately before the cul‐de‐sac turnaround. Please note that the MBTA commuter rail line traverses the property north to south so that the parcel located on the west side of the railroad tracks is not accessible on foot. Linebrook Woods Conservation Area is located at 275 Linebrook Road next to Marini Farms. It is a 78-acre parcel of wooded uplands and wetlands, with trails extending north to the town watershed lands trail network, and to the south into Willowdale State Forest. Strawberry Hill (Formerly Wendel) – 106 Acres – Map 22D, Lot12: Because of the urgency of this project (the property was being actively marketed for sale) and because the Open Space Program Manager had not yet been hired, the Trust for Public Land (TPL) was invited to step in and assist the Town in the permanent protection of the former Wendel property in the early winter of 2000. After many months, TPL successfully negotiated an agreement to acquire the entire property for $4 million. Strawberry Hill and Greenwood Farms trails, total about 3.5 miles. After agreeing to pursue this approach and after preparing a proposal to the United States Fish and Wildlife Service (USFWS), the Town received favorable notice in November 2001 that the USFWS would provide $1 million towards the Department of Environmental Management’s (DEM) acquisition of a conservation restriction and DEM (together with the Executive Office of Environmental Affairs) agreed to provide an additional $500,000. Because DEM/EOEA’s contribution was contingent upon funding authorization from the state legislature (the “Environmental Bond Bill”), the Town agreed to front the state’s contribution subject to reimbursement, and this additional Town expenditure was authorized at the fall 2001 STM. The Town acquired the property in March, 2002 and shortly thereafter the Town Manager appointed a Stewardship Committee to develop a management plan for this property and make recommendations on how to manage this new public acquisition. The Town will manage the property for wildlife habitat and passive public recreational enjoyment. As of summer 2003, the Town is working to build a six‐car, unpaved parking area to accommodate public access of this conservation property. Turkey Hill Conservation Area (formerly Riley) – 22.5‐acres – Map 41A, Lot 40 & Map 40, Lot 81 – 31 & 33 Pineswamp Road: The Town purchased 22½ acres of land, now known as the Turkey Hill Conservation Area, on November 7, 2006. The property consists entirely of mature upland deciduous forest and includes the summit of Turkey Hill, the highest undeveloped point in Ipswich, from which the distant coastline in the area of Great Neck can be seen on a clear day if there are no leaves on the trees. The purchase price of the property was $580,000, all of which was funded by the Open Space Bond. 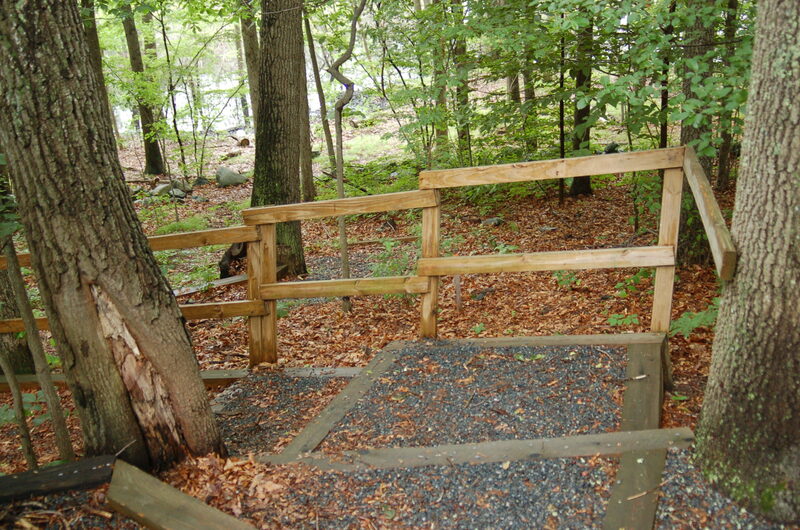 The Town established public access to the property by developing a parking area at the entrance to 27 Pineswamp Road. 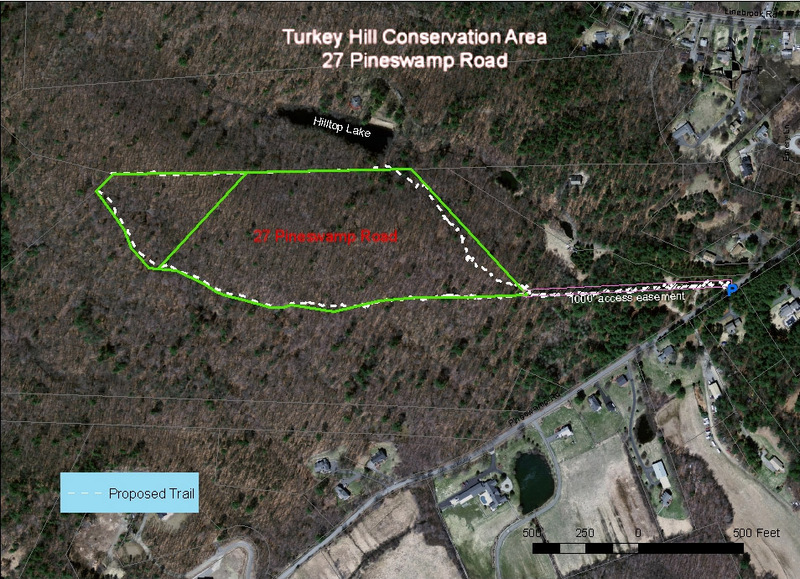 A 30‐foot wide trail easement leads from there approximately 1000 feet to the Turkey Hill Conservation Area. The tax taking proceedings for this parcel were begun on July 12, 1990 and completed on September 30, 2000 (decree of Land Court, Case No. 106358 T.L.). The back taxes totaled approximately $6,000. The Board of Selectmen agreed, that this parcel should be transferred to the Conservation Commission. Article 29 of the spring 2002 Annual Town Meeting authorized this transfer. The 128-acre Pony Express Farm is bordered by Chebacco, Essex and Candlewood Roads. 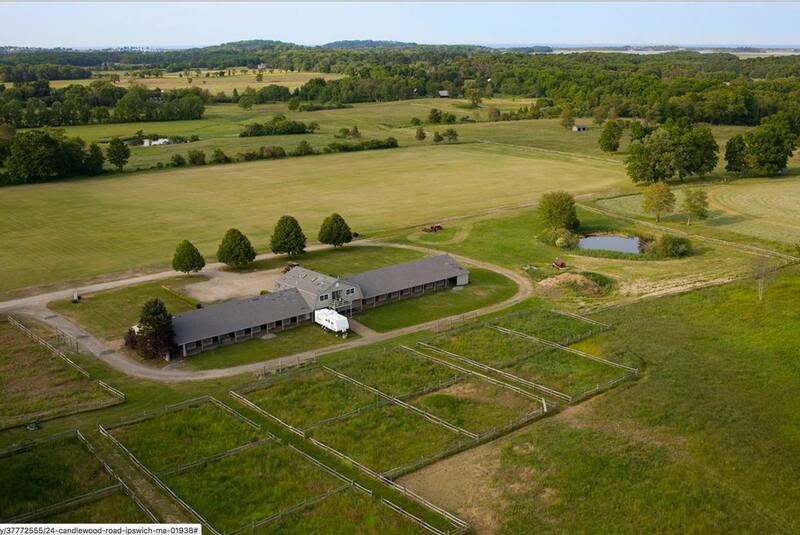 The property includes a large polo field, open fields, woods, and trails;and wetlands along the western bank of the Castle Neck River. The property is being purchased by the Town of Ipswich, the Essex County Greenbelt Association,and the Massachusetts Division of Fisheries and Wildlife for conservation and recreation purposes. The Town will convert the polo field into four full-sized multi-purpose athletic fields, and has the option to build an additional two fields in the future.Greenbelt will sell a portion of the northern side of the property where there is an existing house and stable.The remainder of the property will be permanently protected as open space for passive recreation, natural resource protection,and agriculture by Essex County Greenbelt and MA Fisheries and Wildlife. 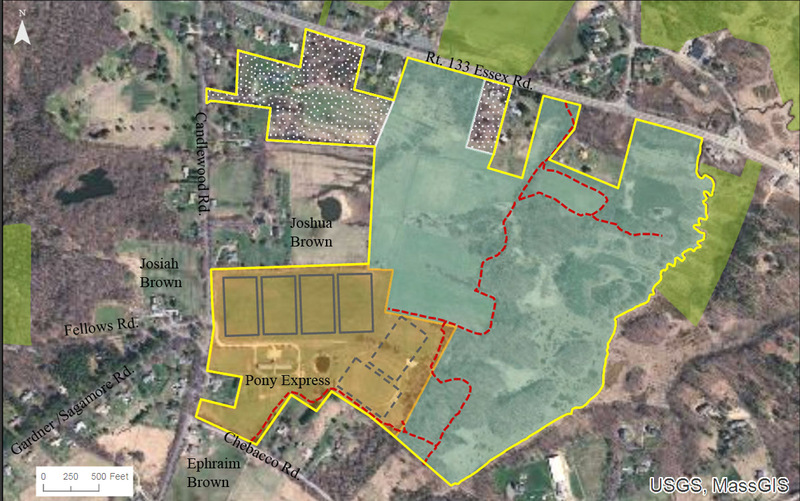 Ipswich voters approved $2.15 million from its current $6.35 million open space bond for the purchase of the property and up to $227,000 to develop the athletic fields, at the Special Town Meeting in January 2017. Greenbelt will raise $1.4 million through private fundraising and a private sale, subject to conservation restrictions, of a portion of the northerly area of the property. The Massachusetts Division of Fish & Wildlife will contribute $500,000 from a combination of state and federal funds. 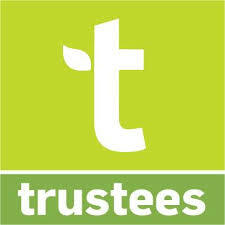 More information about the project can be found in the Frequently Asked Questions and the project map. Pony Express Athletic Fields Master Plan, provided by Huntress Sports. It provides the full potential scope for improving the 30.6 acres as an athletic field facility. Willowdale – 40 acres – Map 50, Lot 2: This partnership acquisition was completed in June 2001. Essex County Greenbelt Association was a key partner in this project that also included the Department of Environmental Management (DEM) and the Town of Topsfield. This 40‐acre inholding within Willowdale State Forest was slated for development before the project partners stepped in and successfully negotiated the acquisition. The project partners contributed the following amounts to the acquisition: Department of Environmental Management ($1,400,000), Essex County Greenbelt Association ($700,000), Town of Ipswich ($300,000), and the Town of Topsfield ($100,000), for a total of $2,500,000. DEM holds an 84% interest in this property, the Town of Ipswich holds a 12% interest and the Town of Topsfield a 4% interest, reflecting the financial contributions of the various partners. Because the parcel is part of the Willowdale State Forest complex, the partners have agreed that the property will be managed by DEM. This project was the first expenditure out of the Open Space Bond. Ross – 29.5 acres – Map 21, Lot 104: In September 2001, the Town received a “Notice of Intent to Sell” under Chapter 61A for the Ross property off of Maria Drive. 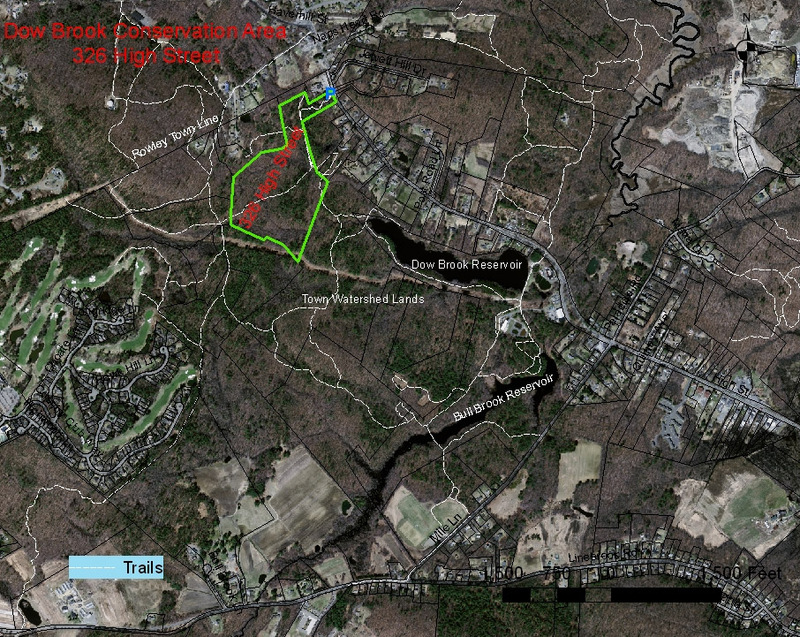 Since this parcel may provide a site for the relocation of “Brown’s Well” off of Route 1A and therefore has significant public benefit in addition to the wildlife habitat and potential public trail network that it provides, the Open Space Committee and Department of Planning and Development recommended and the Board of Selectmen agreed, that the Town should act on its right of first refusal under Chapter 61A. This parcel was added to the “list of priority parcels” for which Open Space Bond funds can be expended per the vote of the fall 2001 Special Town Meeting. The Town purchased the property on April 30, 2002. The Town also received a grant from the Department of Environmental Protection to cover 80% of the acquisition price. After this reimbursement, the Town’s cost for this property was $78,000. In the spring of 2001, the Town was approached by Ipswich River Preservation, LLC (IRP), which had recently formed in order to acquire and protect Scott Farm. This conservation restriction eliminates all development from 45‐acres including all of the front fields, all of the river frontage and adjacent forest. The Town paid a total of $1.45 million out of the Open Space Bond authorization (spring 2000 ATM) for the purchase of this conservation restriction. This was the second expenditure using funds from the Town’s Open Space Bond. The former James H. Proctor Estate lies between County Rd and Fellows Rd., built by James H. Proctor in 1895. The Catholic Church purchased the property, where it was used as a novitiate by the Oblates of Mary Immaculate, and later became the Catholic school Don Bosco. 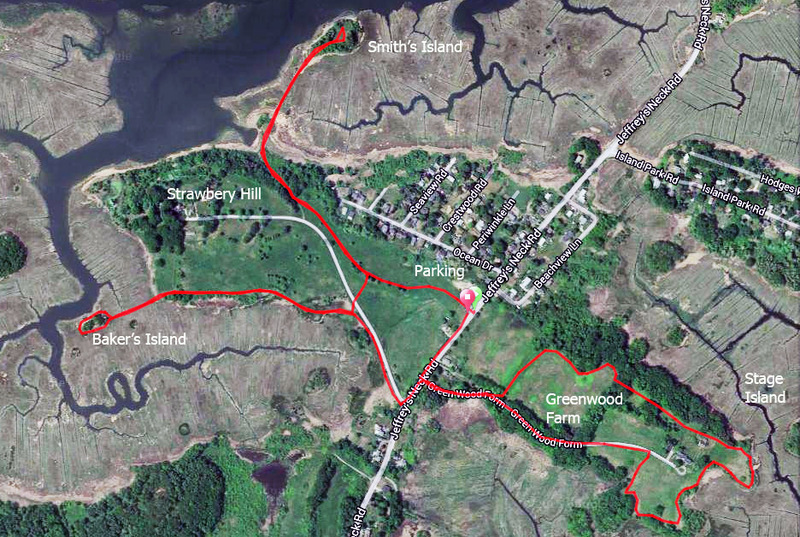 Since 1999 the Proctor estate has been the home of New England Biolabs, which provides walking trails open to the public, in connection with the Ipswich Great Estates Bylaw. Trails, paths and walkways lead through the historic center of Ipswich. A parking lot for the Riverwalk behind Market Street was provided by EBSCO, and the town and state provided a new pedestrian bridge, replacing one that had been destroyed years earlier. Cross South Main to the Visitor Center/ Veterans Memorial Green. A short distance further a narrow trail winds along the River, ending at the Old South Cemetery. From the County Street Bridge, follow the Sidney Shurcliff Riverwalk to the Town Hall, and continue along Scenic Water Street to the Town Wharf. These trails predate the Ipswich Open Space Program. 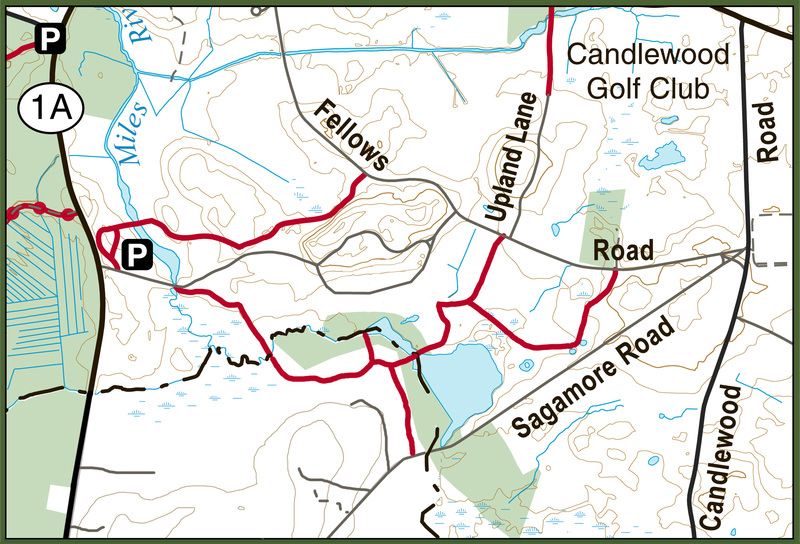 Willowdale offers trail-use opportunities on 40 miles of trails and fishing and boating on 100 acre Hood Pond, owned and managed by the Commonwealth of Massachusetts. 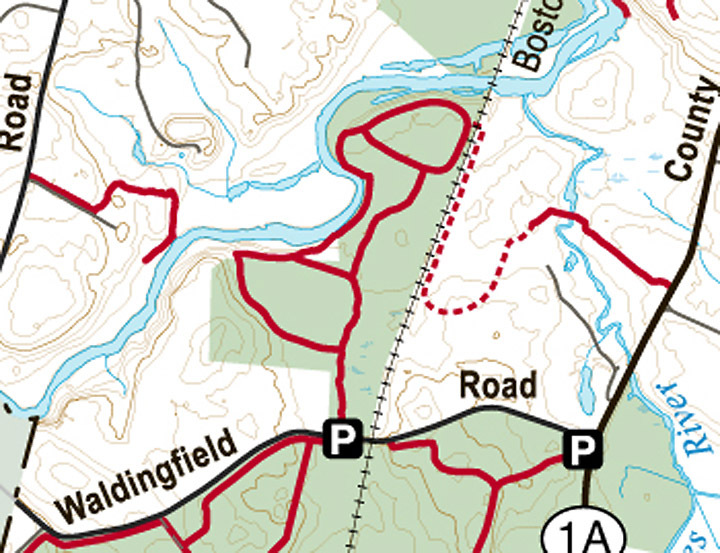 There are no developed recreational facilities at the Forest which exists as two separate parcels divided by Route 1. The eastern block of the Forest abuts Bradley Palmer State Park and the Ipswich River. 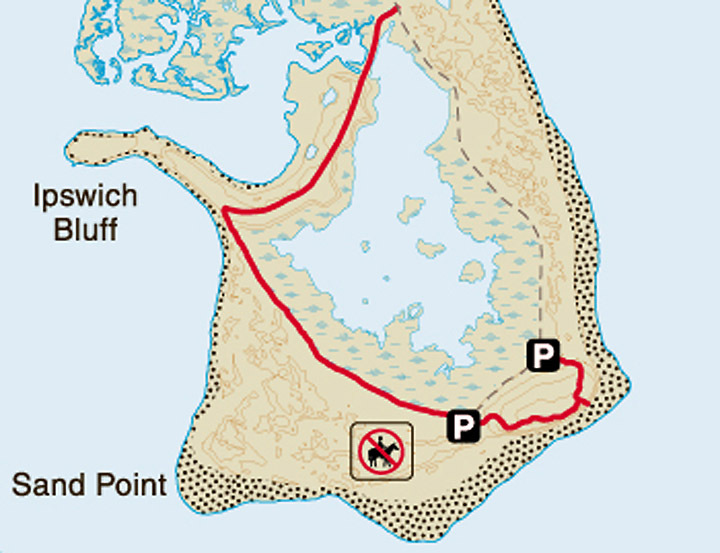 Sandy Point is a 777-acre park at the very southern tip of Plum Island, and is an important nesting area for the piping plover, a threatened species, and the least tern, a species of special concern in Massachusetts. Passive recreational activities include walking, beachcombing, fishing and birding. Access is through the abutting Parker River National Wildlife Refuge. 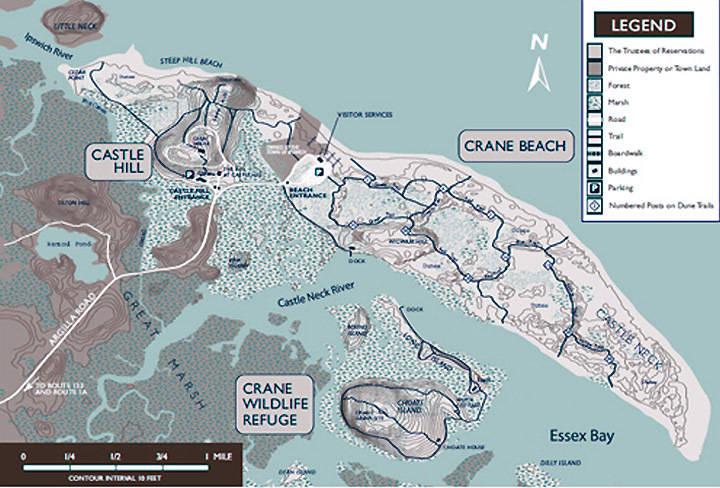 The spectacular Crane Estate encompasses more than 2,100 acres in Ipswich, and includes three properties: Castle Hill, a National Historic Landmark that is the home of The Great House, Crane Beach, and the Crane Wildlife Refuge, with miles of trails through the dunes and along the Castle Neck River. 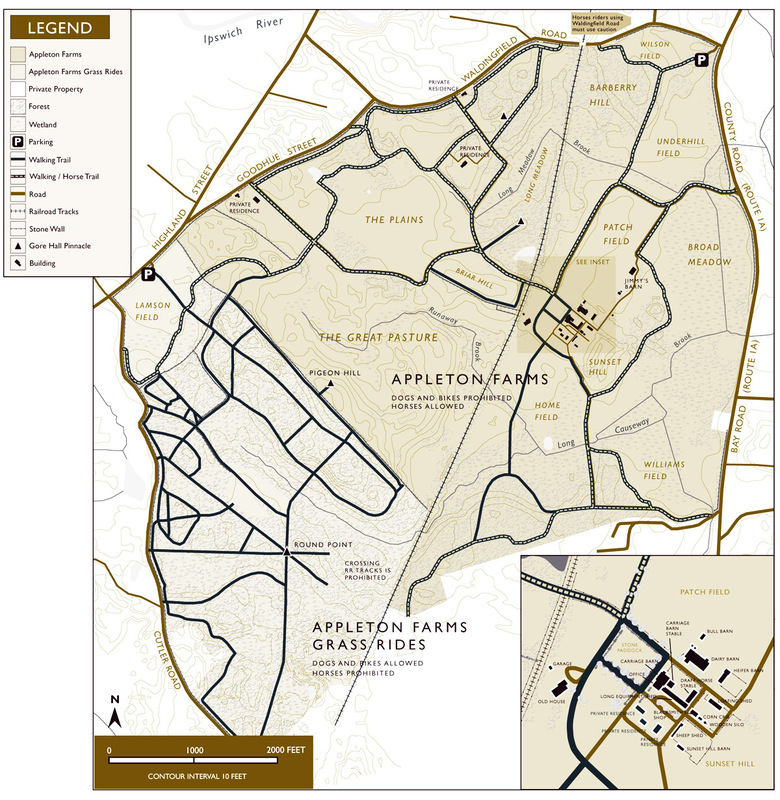 Appleton Farms is the nation’s oldest operating farm, with 658 acres of wide open fields and active agriculture, including livestock, hay and produce. Meandering farm roads and working farm yards are surrounded by ancient trees and beautiful views. Adjoining to Appleton Farms Grass Rides. 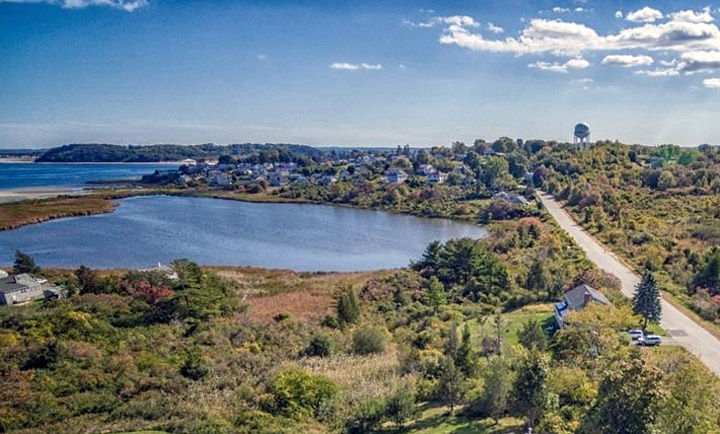 This former coastal farmland now welcomes visitors to a broad salt marsh and a dike path that leads to a one mile loop trail around Eagle Island. The island overlooks extensive open marsh and is one of the least disturbed parts of the entire 25,000-acre Great Marsh. The 59-acre Julia Bird Reservation parallels the railroad tracks and extends out to the to the banks of the Ipswich River. Adjacent to Appleton Farm, it is part of an extensive network of protected open space along the Ipswich River throughout Ipswich, Hamilton, Wenham and Topsfield. In recent years, this connected “greenbelt” has been the site of the New England Sled Dog Race Series in January. Greenbelt’s 5400 acres of conserved landscapes across Essex County, including 29 properties in Ipswich. All properties owned by Greenbelt are open to the public free of charge. The Bay Circuit is a permanent recreation trail and greenway extending through 37 towns in Eastern Massachusetts, linking parks and open spaces in fifty-seven Boston area communities. Since its founding in 1990, the Bay Circuit Alliance (BCA) has served as the catalyst to make the Bay Circuit dream come true. More than 230 miles of multi-use, passive recreational trail have now been dedicated, thanks to the contributions of hundreds of volunteers in 37 cooperating towns. The Alliance is a partnership of organizations and individuals, public and private, working to complete the Bay Circuit Trail and Greenway. BCA’s membership consists of six regional, four statewide, and more than 30 local member organizations, plus many interested individuals. Beginning at Plum Island and ending in Kingston Bay, the trail and greenway, is located close to 4 million people in Eastern Massachusetts. The trail provides close-to-home recreation including: walking, biking, snowshoeing, horseback riding and cross-country skiing.